Have you ever heard of mica? You’re not alone if you haven’t. Mica is the mineral that puts the sparkle in cosmetics. It is also widely used as a component in mobile phones. In fact, it’s more than likely that you actually own something made of mica. What you might not know is that there is strong evidence linking the mica industry with child slavery . The reason you might not know about mica and its connection with slavery is because at the time when social media is becoming a dangerous amplifier of ‘fake news’, the mainstream editorial focus is increasingly being driven by what consumers wish to read. Today, the ‘global conversation’ resembles an echo chamber of noise in which our very own opinions and values are the only thing standing out, unchallenged. As traditional media models are being disrupted, consumers are given the power to pick and choose the news they want, filtering out all other points of view. Take social media. All it takes is for us to unfollow a specific source or to customise our newsfeed, and we are safely insulated in our own ‘news bubble’. As a result, many stories we should be hearing about simply never see the light of day - in stark contrast with the important role journalism is called upon to play in society: the one to act as a watchdog, to shed light on little known issues, to give a voice to the voiceless, to start a conversation. When journalism fulfils that mission it can successfully lead to dramatic change, as with our mica investigation. The story was widely picked up by press around the world , prompting the regional governments of two provinces to conduct raids, arrests, public awareness campaigns, geological surveys and steps to regulate the illegal industry. The impact didn’t stop there: Volkswagen also decided to suspend ties with implicated suppliers as a direct result of the investigation. 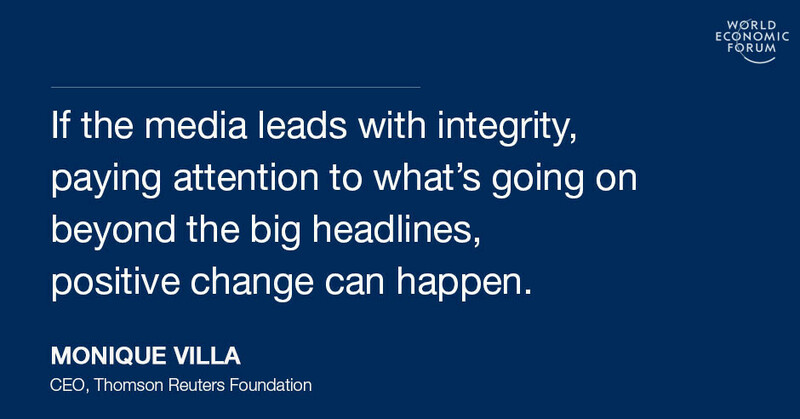 What this tells us is that if the media leads with integrity, paying attention to what’s going on beyond the big headlines, positive change can happen. I have seen first hand what shedding light on under-reported stories can achieve. When five years ago, the Thomson Reuters Foundation first started to shed light on slavery and human trafficking at the first Trust Women conference, few knew the true scale of this global scourge. Five years later, the global media has joined the movement. Some excellent work has been done in reporting slavery by the Guardian , the New York Times , and many others around the world. As a result, slavery has finally entered the political discourse. The UK successfully passed the Modern-Slavery Act and appointed an Anti-Slavery Commissioner. In India – the country with the highest number of people trapped in slavery – there is now a firm commitment from the President to fight child exploitation. Precisely because of the important role played by the media, consumers are increasingly informed and – as a result - are beginning to push companies to eradicate forced labour from their supply chains. Business is responding proactively as recently proven by our Stop Slavery Award . We know that raising awareness of under-reported issues is extremely powerful and can lead to positive change. And this is precisely why media organisations have a moral responsibility – now more than ever - to broaden their editorial approach to include news that somehow escapes the spotlight. It is time for the media to reclaim the power to define news, to set the agenda. Policy changes and laws are created most often when a critical mass of the public begins to care. Engaging with these issues begins with public awareness. Let’s find the courage to tell the stories that people want to hear, even if they don’t know it yet.